St. Paul, MN – An out of control “facts-only” rap battle left two people with severely hurt feelings and another four with varying levels of embarrassment Wednesday evening. Blevins, who conceded defeat in the fourth round, was reported to have received significant emotional scarring which will most likely require some positive reinforcement from friends and family, as well as a full-night’s sleep. 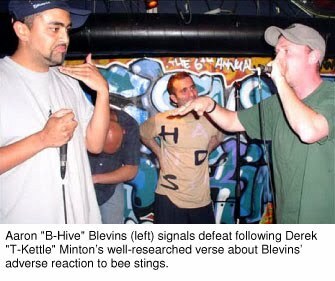 The full extent of Minton’s hurt feelings were not immediately available. After evenly dividing the past decade between imagination-deprived songwriting and an apathy towards anything resembling his former success, it looks as though Weezer frontman Rivers Cuomo has finally taken the plunge fans and critics have been expecting for years and become a complete and utter sell-out.